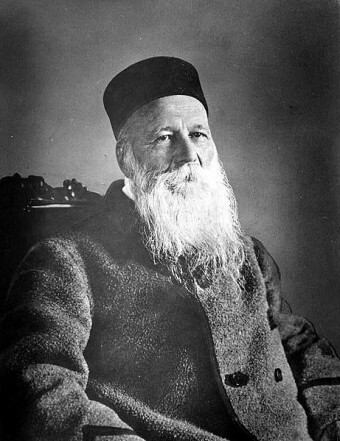 On May 8, 1828, the man who founded The International Committee of the Red Cross, Henry Dunant, was born. In 1922, almost a century after his birth, the eighth of May was declared a day dedicated to the International Red Cross, in this way honoring its founder. Dunant’s dream was to prevent and alleviate human suffering, without discrimination. Despite being born to wealth, he died in poverty partially due to his dedication to charitable work. He remains one of the greatest humanitarians in history, but few today know much about him. So who was Henry Dunant really? Henry Dunant was born in Geneva, Switzerland to wealthy parents. His father was a successful – and generous – businessman who early on instilled in Dunant’s young mind the value of helping others. His father and grandfather were men of power and prestige in Geneva, and had held various positions such as membership in Geneva’s governing council, director of a Geneva hospital, and mayor of a small city near Geneva called Avully. The influence of women is an essential factor in the welfare of humanity, and it will become more valuable as time proceeds. Henry busied himself with a number of charitable activities. Anti-Semitism was pretty intense at that time in Europe, and Dunant worked against this, particularly encouraging Christians and Jews to band together. He also became a member of the Geneva organization known as the “League of Alms,” whose main purpose was to provide spiritual and material assistance to the poor and sick. He frequently visited Geneva’s jails, where he tried to rehabilitate and reintegrate prisoners. Dunant was religious from his earliest youth, and had felt that religion could be the answer to many moral issues in society. Partially motivated by this, he became an active member of the Young Men’s Christian Association (YMCA) and co-founded a YMCA in Geneva in 1852. He went on to help found the World Alliance of YMCAs which was first developed in 1855. Along with his colorful social life and all his humanitarian efforts, he was prospering on a professional level too. In 1849, he was appointed to the Bank of Geneva. His work there was so impressive that in 1853 he was appointed interim general manager of the subsidiary company in Algeria, where he also started his own business. In 1859, he had to consult with Napoleon III concerning his business, so he traveled to northern Italy where Napoleon III was conducting a military campaign. This trip changed his life. On the June 25, 1859, Henry Dunant witnessed firsthand the tragedy and horrors of war when he toured the area the day after the Battle of Solferino, a particularly bloody mutual slaughter, with tens of thousands of soldiers left on the battlefield dead or dying. This traumatic experience had such an impact that when he returned to Geneva, he wrote a book about what he had seen, A Memory of Solferino, which he published at his own expense. The book was translated into many languages, and was circulated to most of the influential leaders and politicians throughout Europe. Adoption by all civilized nations of an international and sacred principle which would be assured and placed on record by a convention to be concluded between governments. This would serve as a safeguard for all official and unofficial persons engaged in nursing war victims. The idea for the foundation of the Red Cross had been planted in his mind and heart. After witnessing the direct aftermath of the battle of Solferino, Dunant dedicated his time, and much of his money, to the relief of mankind from the pain incurred in war. He traveled to every major city in Europe to spread the message of the destructive and inhuman nature of war, and to promote the importance of peace. In 1862, he sent Gustave Moynier, president of the Geneva Society for Public Welfare, a copy of his book A Memory of Solferino. Moynier was touched by the book’s essence and decided to invite Dunant to a special meeting on February 9, 1863 of the Geneva Society for Public Welfare. Following this meeting, it was decided to establish an International Committee for Relief to the Wounded of War. This organization became the International Committee of the Red Cross. Dunant served as a member of this committee and worked as its Secretary for some years. Another key facet of his work was the suggestion that there was a need for, “a government treaty recognizing the neutrality of the agency and allowing it to provide aid in a war zone.” This idea ultimately led to the first Geneva Convention treaty. While Dunant’s humanitarian work was producing amazing fruits, his business and financial affairs weren’t doing as well owing to nearly complete neglect by Dunant. By 1867, he was forced to declare bankruptcy. Financially ruined and with debts exceeding one million Swiss francs, he resigned from his position as Secretary of the International Committee. On September 8, 1867 the Commission decided to accept his resignation not only as Secretary, but as a member as well. In disgrace, Dunant went to Paris, where he ended up sleeping on benches in the parks and eating scraps of food where he could find it. But poverty did not stop his humanitarian work. During the Franco-Prussian war, he visited and comforted the wounded who had been moved to Paris, and introduced the use of armbands to identify the dead. At the end of the war, Dunant traveled to London, where he sought to organize an international conference concerning the problem of prisoners of war, and even though the Tsar of Russia encouraged him, England was against such a project. An international conference on the “total and final abolition of the slave trade” was launched in London on February 1, 1875, also instigated by Dunant. Of course, humanitarian work usually doesn’t pay well, or at all in many cases, and years of wandering and extreme poverty followed for Dunant. Through the years, he traveled on foot in Germany, Italy and Alsace, living on donations and the hospitality of friends and new acquaintances. Finally, in 1887, Dunant found himself in the Swiss village of Heiden, where he fell seriously ill. He found refuge in the local nursing home, and it was here that he was discovered in 1895 by a journalist who wrote an article about him. A few days later, the article, and the fact that Dunant was still alive which was news to many, was republished throughout Europe. Messages of sympathy and acclaim reached Dunant from all over the world; Dunant was again celebrated and honored, and in 1901, he received the very first Nobel Peace Prize for his integral role in the establishment of the Red Cross as well as the first treat in what would become known as the Geneva Conventions. Now with the Nobel Peace Prize money in hand, you might wonder if Dunant perhaps started a new business with it to take himself out of poverty and debt, or at the least move out of the small nursing home room he’d occupied for several years. In fact, he did not. He continued to live there for the rest of his life. As for the prize money, some 75,000 Swiss Francs (about $375,000 today), he didn’t spend any of it himself, leaving it untouched in the account setup for him. Upon his death nine years after winning the prize, he left much of the money to various charitable organizations, as well as to the nursing home where he had been living with the stipulation that they leave one free bed open for the poorest of the community to use in times of need. He also left a certain amount to pay back some of the debts he still had from back in his business days. The greatest men are the simplest, they say, but this one really moved my soul!!! His life and work is so inspirable and touching,one of your best articles,GONGRATULATIONS! I have donated money to this international organization for many years, but never knew anything about the man behind it. Thanks for the lesson. I like learning from you: your writing is so lucid and uncluttered. Axios! WONDERFUL!!!! Thank you for such a beautiful read Theo! if DUnant and MOther Theresa should comeback to live, then the world will be fine. we,re inspired by their good works. I’d love to know how religion had an effect (particularly towards the end) on Dunant’s life.